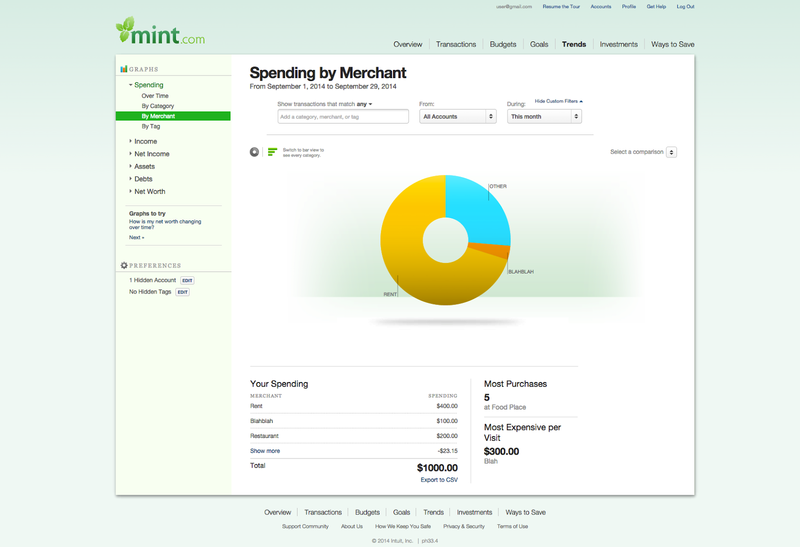 If you use the online financial planning app, Mint, you've probably wondered what decade it was designed in. Just browsing through the site presents a clutter of different styles, an incredible use of box-shadow, and more border-radius than should be permissible by law. 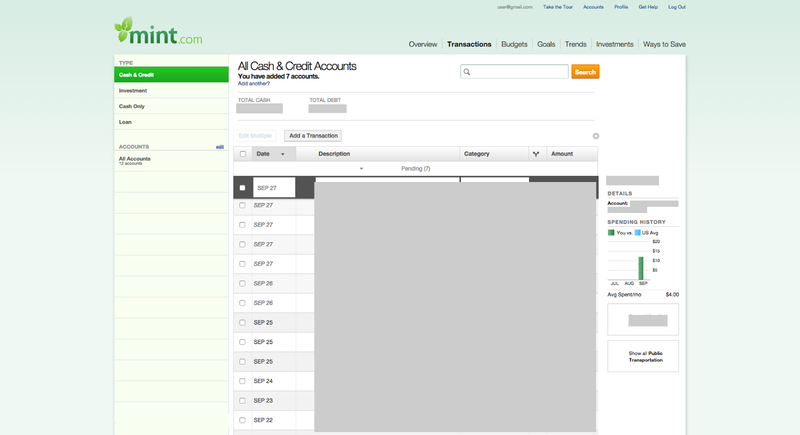 It's time for an upgrade (Intuit, if you're reading this, please hire some designers!). As you can see, not a ton has changed; my goal was not to completely design a new site. However, as I'll show in the next screenshots, I've tried to unify the interface a bit, get rid of the overzealous use of shadows, gradients, and rounded borders, as well as add a bit of white space to spread things out a bit. I also tried to flatten some of the progress bars to get rid of the outdated "Web 2.0" gloss effect. Within the budgets page, I've gotten rid of all sorts of rounded glossy boxes and replaced them with whitespace and flat progress bars. Not much has changed in the "Trends" page, but I did get rid of a lot of the cramped feeling and spread the content out a bit. 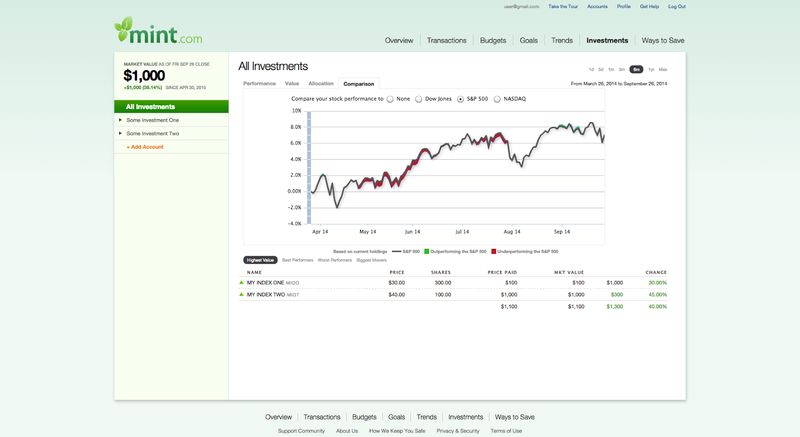 Increased the overall width to 1200px from the original 900. This gives us more room to work and added whitespace. Get rid of the "Ways to Save" page. 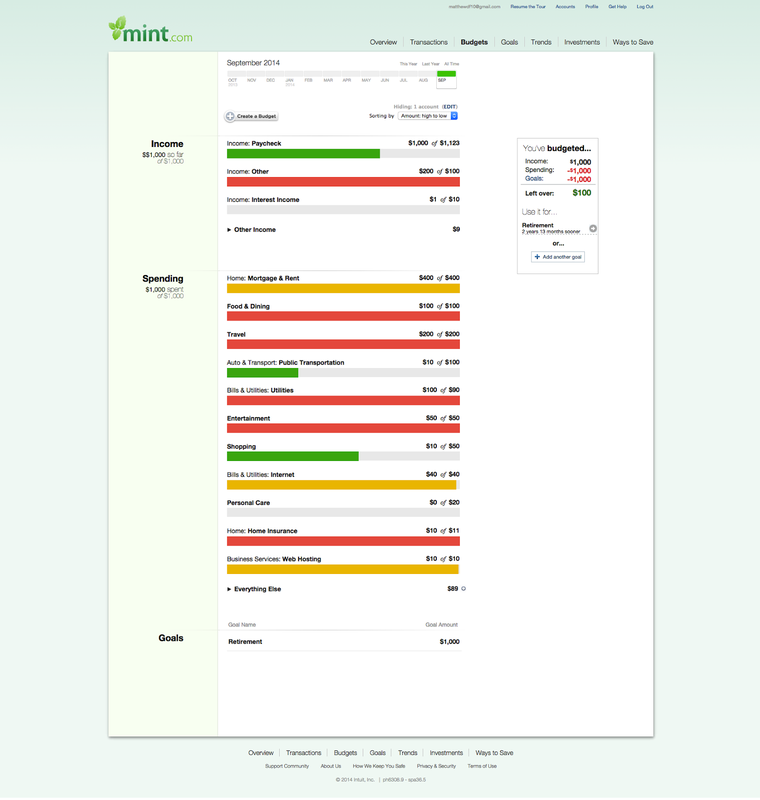 This is how Mint makes money and I don't want to destroy their revenue stream. Modify the "Goals" page. It is so poorly designed right now with background images and borders and popups I wasn't brave enough to touch it. Now, for a disclaimer: I do not guarantee that this will work for everyone's account. 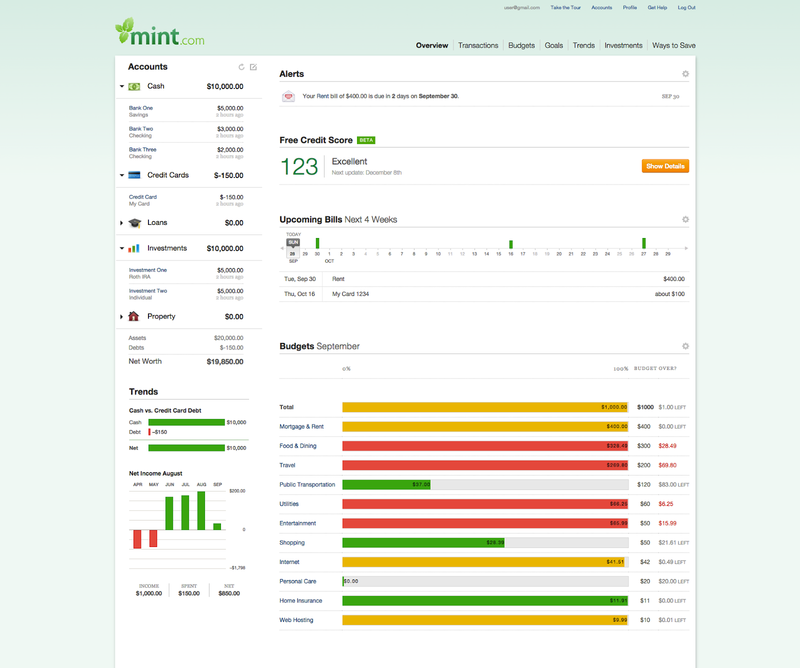 I tried to test it as much as possible, but there are a lot of hidden pieces of functionality within Mint that I may have missed. Finally, this code is all written out below. It's entirely CSS, so you can decide which parts you want to use. This code will not steal your account info or do anything else malicious. I also don't make any guarantees about supporting this in the future. 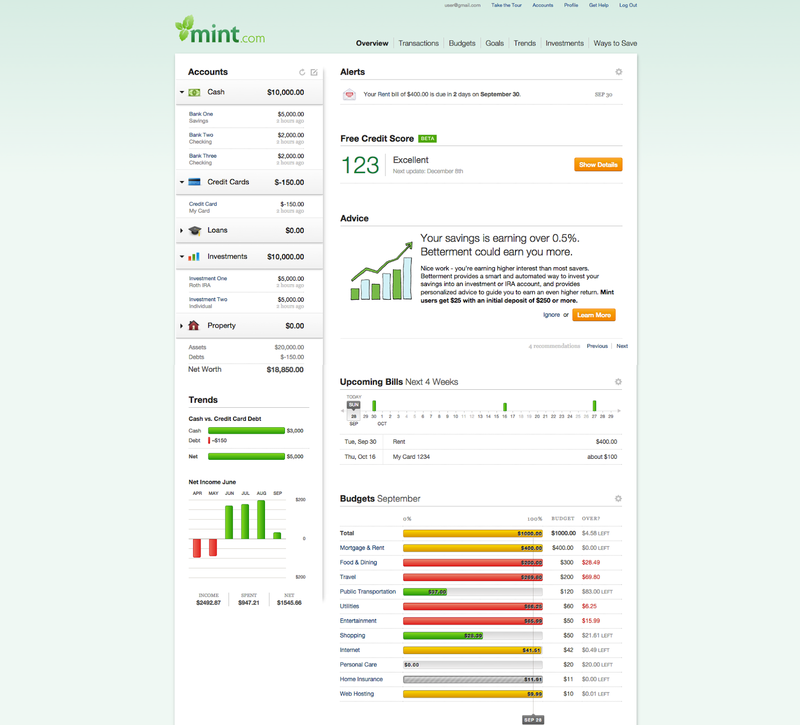 Mint could change their site tomorrow and break all of this. Fortunately, it's very easy to undo (just erase the user styles). So how can you get this? It's all CSS! I use an extension called "StyleBot" for Chrome (download link), but Firefox has similar extensions as well. Simply copy and paste the following styles into the extension by opening the extension while on mint.com, then clicking "Edit CSS" at the bottom, and then pasting it in. This should fix the Input/Output errors and allow you to cleanly remount. After working at my current gig for about a year now (internship plus full-time), I wanted to take some time to outline my experiences transitioning to more of a developer operations role from my existing security background. The transition has been fairly straight-forward, as much of the work I do currently touches security in some aspect. However, the biggest point I've noticed is how much security considerations are involved when developing tools for a traditional developer operations requirement. While I am a big proponent of at least some security training for everyone in a technical role, it remains to be seen just how much is "enough." Obviously, as the realm of technical fields continues to expand at its current pace, having every member of a technical team fully trained in the security of the applications they are developing is impossible. Yet it is also imperative that they at least understand the risks associated with these applications; doing so should be a requirement of a good developer. As a "Developer Operations Engineer" (a role whose title is still rather undefined and unstandardized), I generally focus on several categories of projects: infrastructure development, monitoring and incident response, and deployments and the application lifecycle. While this is a highly compressed view of my role, each of these has a dizzying array of security concerns. While some companies offload much of these concerns to a security team, smaller companies need to remain vigilant of their impact. In most modern startup environments, infrastructure development typically refers to everyone's favorite buzzword: the cloud. Amazon Web Services, Microsoft Azure, Google's App Engine, the list goes on. The security concerns associated with the cloud are not the focus of this post, but I do want to highlight places where security is especially important. Almost every one of these services has security enhancements that are not used as often as they should be. For example, AWS's Virtual Private Cloud is not only free, but can also greatly improve security when used properly. Yet quickly starting instances from EC2 still requires less hassle and so remains the more common choice. Another example is the use of security groups. AWS's security groups are infinitely customizable, yet simply opening a port to the world (0.0.0.0) is a tempting simpler option. While hosted infrastructure providers like Amazon and Google abstract a lot of security work away from the customer, good security practices still require active participation. Monitoring and incident response is perhaps the area in which a lack of security can have the biggest impact. While many "DevOps" engineers view monitoring in terms of system performance, monitoring must also cover system security. Disk space, CPU utilization, and memory usage are all important indicators of a healthy system, but so too are login attempts, changes to file permissions, and unauthorized outgoing network connections. A good monitoring platform must also monitor for security events that could signal an intrusion or potential breach of security. In the same light, the response to a security event should also contain a viable plan for mitigating the same risk in the future. Finally, the deployment of applications is a critical component of the security of an infrastructure. Because the main goal of deployments from a developer operation's standpoint is automation, any security bugs introduced once tend to be replicated. For this reason, it is imperative that the deployment process and any actors in it (Jenkins, AWS S3, etc.) are fully secured and audited often. Vulnerabilities that are present here can expand exponentially when deployments are pushed. The role of developer operations or server engineering is rapidly changing and expanding. While it does, it is important, if not necessary, to include security in the expansion and ensure that those building a company's most critical technological parts are also trained in protecting them. This past weekend was not a good one for at least twenty or so celebrities, as well as Apple's iCloud service. According to a number of reports, a large number of female celebrities had personal photos released from their private iCloud accounts after a hacker was able to gain access to them. While we don't know all the details yet, it is likely that a combination of social engineering, weak passwords, and publicly available security question answers merged to allow the attacker access. In light of these events, it's a great idea to review the security of your account to avoid any accidental exposure of your private information. Make sure that two-factor authentication is setup. If it is not, begin the process by clicking the link. You will be asked for several pieces of information, including a phone number and answers to your security questions. You will also be asked to provide the code texted to you as well as given a very long reset code which should be treated as if it is your password (in other words, don't write it down some place that will be lost, and don't save it on your desktop). Once you enter all this information, two-factor authentication will be setup. Congratulations, you've just made your iCloud account ten thousand times more secure! The answers to your questions should not be something an attacker can find on Facebook, Twitter, your blog, or on your abandoned MySpace page. Be very specific in your answers. If the question asks where you met your significant other (a common question), don't use "Los Angeles" as the answer. Instead, provide a specific street name, a friend's name who introduced you, etc.). Don't choose simple questions. "What is your favorite color?" and "Where were you born?" are ridiculously simple questions for attackers. Choose more complex questions that ask for information not found in your online profiles. Securing iCloud is relatively simple and doing so can go a long way in securing your personal photos and documents. Unfortunately, leaks like the one that happened this weekend are going to occur. But by following these guidelines, at least you can make the hacker's efforts less rewarding, and in most cases, stop them entirely.